On March 1, 1922, the Chief Ranger said, “John, you and Martha will be going over to Hog Ranch Ranger Station to make reports on the construction of the Hetch Hetchy Dam.” The Station was called Hog Ranch in the early days. Some years later it was re-named Mather. The Station and Hetch Hetchy are in the northwest part of the Park. At that time four hundred men were working on the dam. Due to heavy snow we had to make a roundabout trip. We rode our saddle horses down the Merced Canyon along the railroad track to Jenkins Hill, then climbed the mountain to Bower’s Cave Hotel where we stayed that night. It was a ride of thirty-eight miles. Mr. and Mrs. Wenger, the owners, welcomed us for dinner and fed our saddle horses. During the night a mountain lion got into the corral and killed a burro. Mr. Wenger heard the noise and when he went to the corral at dawn he found that the lion had devoured part of the burro. The lion fled leaving tracks on the road near the barn. The next day we rode on via Buck Meadows and on up the Old Mather Road. There was snow on the road to Mather Saw Mill so we rode along the railroad track for about five miles and arrived at City Saw Mill Camp about 5 p.m., tired and hungry. The cook said supper was ready and for us to come in and eat. The supper was a regular logger’s meal and we did full justice to it. After the hearty meal we rode on to Hog Ranch Ranger Station, one mile up the road, along the railroad track. We had shipped our bed rolls and food supply by the railroad and the Camp Boss said they would throw our camp gear off when the supply train went by our door in about an hour. We arrived at the Station just before dark, put up our horses in the barn and gave them a good feed which they had well earned. We built a fire in the cook range and the drum heater in the front room and soon we were very comfortable. Beds and food arrived on the supply train as scheduled. The work train supplied the material to the Hetch Hetchy Dam project. Some days we would ride our horses down to Hetch Hetchy and other times we’d ride the supply train. We became acquainted with the superintendent and boss of the construction camp. Mr. Rankin, Mr. Harry Lloyd and Mr. Judson the time keeper were very helpful to us. It was the duty of the ranger to make inspection of the camp and make regular reports on progress and conditions in general. The Raker Act passed by Congress was signed by President Woodrow Wilson, December 19, 1913, and it gave the City and County of San Francisco rights to store water in the Hetch Hetchy Valley and Lake Eleanor in Yosemite National Park. In 1914 the construction of Mather Hetch Hetchy Road was started. In 1915 the camp and reservoir site were established and in 1916 construction of the Hetch Hetchy railroad was put through. The following year construction on the Lake Eleanor Road was completed and the railroad started operating. Actual construction on the dam started in 1919 and was completed May 1, 1923. The Dam was raised an additional 85 feet during the years 1935-1938. The Lake Eleanor Dam was built in 1917 and 1918. This is a buttressed arch dam and the original natural lake level was raised 35 feet. The height of the dam is 70 feet and is 1,260 feet long. In 1915, a saw mill was established in Canyon Ranch, four and a half miles from Hetch Hetchy in Yosemite National Park, to supply lumber for the construction project. Six million board feet of lumber were cut and the timber supply was exhausted so the mill was moved in 1919 to Hog Ranch. There the mill operation was continued until 1924. Park Superintendent Lewis felt it very important to keep a ranger in the area while the project was going on. The assignment for the rangers was usually one month but my assignment was for two months before we were called back to headquarters. The story on the origin and early history of Hetch Hetchy was told to me by an early pioneer, Celia Crocker Thompson. For many years her father and mother owned and operated the Crockers Station on the Big Oak Flat Road near the west boundary of Yosemite. This was a very well known Stage Coach Station and stopping place for the early travelers going to the Park. Celia spent many years there with her parents and knew the area and many of the pioneer families that lived there. Celia told us many stories of the history of early days around Hetch Hetchy and Yosemite. Rancheria and Le Conte Point. Kolana Rock at right. 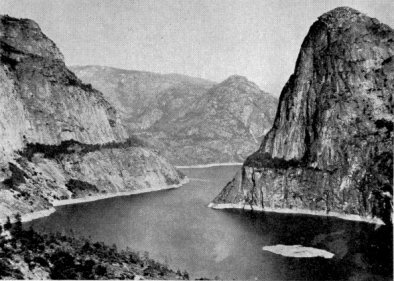 Hetch Hetchy reservoir, 1924, after Dam was built. and traveled on foot from Yosemite Valley to the Hetch Hetchy. His route took him through virgin forests and from canyon to canyon following game trails and finally down into the valley. At that time a sheep herder and a few Digger Indians inhabited the valley. Hetch Hetchy Valley remained primitive until the early 1900’s when the City of San Francisco started negotiations for the water right. After much debate, hearings and petitions, the Raker Act was signed by President Wilson. The first inspection trip by the Board of Supervisors with a party of twenty-five made a trip into Hetch Hetchy on August 19, 1908. They traveled via Yosemite Valley Stage Coach to Crockers Station where they spent the first night, and the next day went on to Hog Ranch which was the end of the road. From there, on mules and horses, they made their way down to Hetch Hetchy and established a camp. Several days were spent riding around the valley exploring for the future dam site. They met Elmer E. Smith owner of some thirteen or fourteen hundred acres of private land. He told the supervisors he was ready to sell for one hundred and fifty thousand dollars. Next day the party rode on to Lake Eleanor, about twelve miles, where they met Wm. Ham Hall, who owned some six hundred acres around the lake. Cabins were available there and the party enjoyed a trout dinner that evening. Efforts were made to buy Hall’s holdings. They made no field contacts in connection with their plan to acquire land owned by the National Park. Two weeks were spent making the trip and they returned by the same route to the Valley. Miguel Meadows got its name from one of the owners of the “Rush and McGill” ranch near the town of Keystone in Tuolumne County. There were two partners, Jonas Rush and Miguel Efferra. They drove their flocks and herds to the mountains each summer for pasture and in this case it was in the region called Miguel Meadows where they settled. People who knew Miguel Errerra over fifty years knew him by no other name than McGill and the ranch and stock as Rush and McGill but Miguel Errera was his true name. It was said that he was separated from his mother when he was a young boy in San Francisco. In his wanderings he joined up with Jonas Rush and the partnership lasted for over half a century. They died within a few years of each other and are buried side by side at Knights Ferry. Miguel Meadows, a large grassy meadow, is situated about eight miles from Hetch Hetchy on the old Lake Eleanor Road. It is now used by the Park Service for a patrol station. The origin of the name Hog Ranch was not derived from a man named Haug nor of early settlers raising hogs there although that did follow some years later. In the early eighties a sheepman pastured his flocks there, and during the shearing and marking season an artistic herder, having some red paint, painted a picture on a smooth boulder of an animal, but failed to write under it “this is a sheep.” When his fellow herder came into camp he said, “I painted it for a sheep but it looks more like a hog.” So the early settlers got to calling the area Hog Ranch. In October 1919, the place was named “Mather” for Stephen T. Mather, Director of the National Park Service at that time. Near the end of April I completed my routine reports and my orders were to return to headquarters. Heavy snow drifts on the Crane Flat summit prevented us from going the shortest way, so it was necessary to take the long way home. Years later, matter of fact it was October 18, 1940, we returned to Mather Ranger Station on another assignment. This time we were to remain through the winter and make it a year round station. It was necessary to lay in a winter supply of food and supplies for the storms would soon set in and close the roads. We shopped all day and almost bought out the store. Food had to be stored carefully to keep it away from mice. There was a small refrigerator to store a few perishables for there were no deep freezes in those days. By Christmas Eve we were snowed in under a foot of heavy wet snow. Our telephone line to headquarters went out and stayed out, but the Hetch Hetchy phone line stayed in most of the winter so we were in touch with Mr. James Gray, who was the City Dam tender, and his wife. We were also able to contact the officials at Mocassin Power House. They called and notified us that as soon as the storm let up they would be up with their V snow plow to open the road to the Dam. They were very thoughtful and asked if we needed anything. The storm abated Christmas Day and the next morning the City Crew plowed our road so we could get out. The City had two employees and families living at Hetch Hetchy and one employee family at Lake Eleanor. At the Mather City Recreation Camp, one mile from Ranger Station, was a caretaker, Mr. Wm. Gray, an old veteran City employee who had been there many years. Mr. and Mrs. Shaw, who operated the city sawmill for years also lived at Mather Camp. At the Evergreen Lodge, owned and managed by the Raveros, some member of the family usually looked after the buildings in winter. During the summer this was a busy resort with meals, lodging, store, gas station and post office open. A few years later the Jack Garrisons took over the resort. Joe Barnes and family, who live near Oakdale, California, operated a saddle and pack station at Mather for many years. Joe was well known as a packer for he handled many pack trips in his days in and out of Mather Station. He was always ready to lend a hand when a fellow was in need. The City of San Francisco maintains a large recreation camp at Mather and each summer many families enjoy the activities and relaxation at this fine camp. The winter passed pleasantly. Spring and summer came before we knew it. The Chief Ranger sent seasonal rangers to man the Entrance Station, the Patrol Cabin at Hetch Hetchy and the Outpost at Miguel Meadows. A Fire Guard was assigned to this Station during the summer as the area was considered a high fire hazard. The Park records show that many forest fires were started and had to be fought in this area. The Mather District had many miles of horse trails and the back country was a real wilderness of deep rugged canyons, timbered valleys, lakes and streams. A true paradise for the campers and fishermen. The district ranger had to see that the trails were maintained and if a regular trail crew wasn’t working in the area the rangers worked alone clearing the trails. I made many trips over the district clearing trails, maintaining pasture fences, repairing trail junction signs and replacing old worn out signs. I found many red-wood trail signs mutilated by bears. In some areas signs had to be replaced several times for it seems the bears took a special delight in leaving their marks on trail signs. I encountered many bears and rattlesnakes. Especially in Pate Valley, Rancheria Mt. and the Tiltill Valley section. This area has always been known as a rattlesnake country. The bears came there because there were plenty of fish and berries. You will note from time to time we have changed assignments from one ranger station to another. It is the park policy for the rangers to get acquainted with the various problems of all the districts.